Download free, play free! Fun extras are available for purchase to trick out your theme park! Golden Ticket: An Amusement Park Sim Game is rated 2.8 out of 5 by 12. Rated 5 out of 5 by willem_jackson from addictive park management game I have played a lot of time management games. This one had me hooked. I like the diffent goals and types of items you can place in your park. Rated 5 out of 5 by pennmom36 from A Quest For the Golden Ticket! Big Fish has got to stop doing this to me, I'm becoming addicted to these Sim games and this one's no exception. It took me forever to get hooked on My Singing Monsters but this one grabbed me hook line and sinker from the get go. You are restoring your Grandfathers Amusement Park and you start out with a handful of run down tents. First you restore the existing buildings then you post a listing for available jobs. 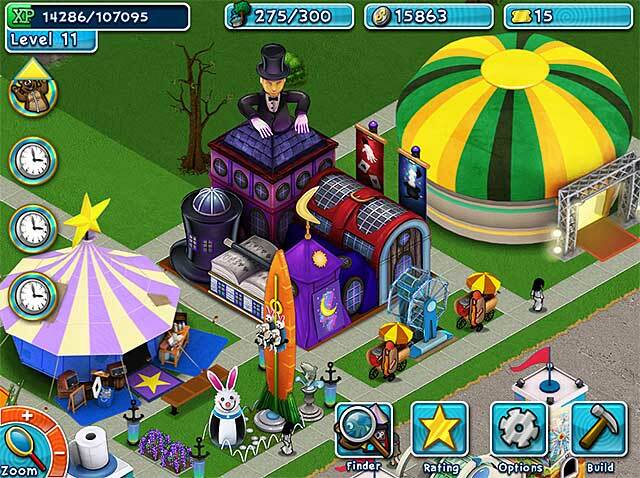 You can build rides or shops, hot dog stands, balloon carts, all kinds of things to build. You buy different items to sell in the shops either souvenirs such as keychains or food items such as hot dogs and brats. Each items costs are different as well as the times before an item is available and you can either wait or spend a golden ticket to speed up the times. And of course the golden tickets are the elusive and key item here, they are hard to obtain and as you progress, almost all items require golden tickets! You get to decorate with shrubs and pathways and various decor and as you run out of space, other plots are available to purchase so expansion is not a problem. Your progress can be saved via your e-mail address if desired. I for one loved this theme, who doesn't want to own an amusement park? Sit back, eat a few hot dogs and enjoy the show! Rated 4 out of 5 by Capri66 from Fix it up There´s a lot to do in this game, you have to rebuild an amusement park. 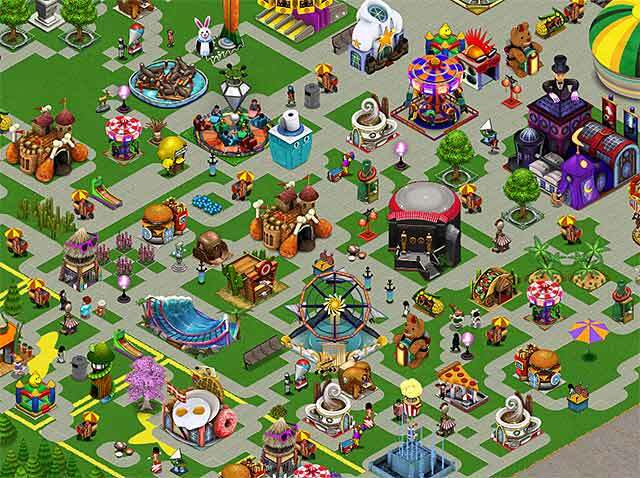 Build rides, attractions, shops, food stands, balloon carts, etc.... and the map is huge. However, it´s moving a bit too slow, all this building takes so much time. Rated 4 out of 5 by sitesoweb from Fun Game I am enjoying the 'Free to Play' games a great deal. I'm currently hooked on Dark Manor and My Singing Monsters and am trying out both this one and the Design This Home that just came out. I have a feeling that this one will be added to my daily routine. I enjoy building and decorating so this is right up my alley. 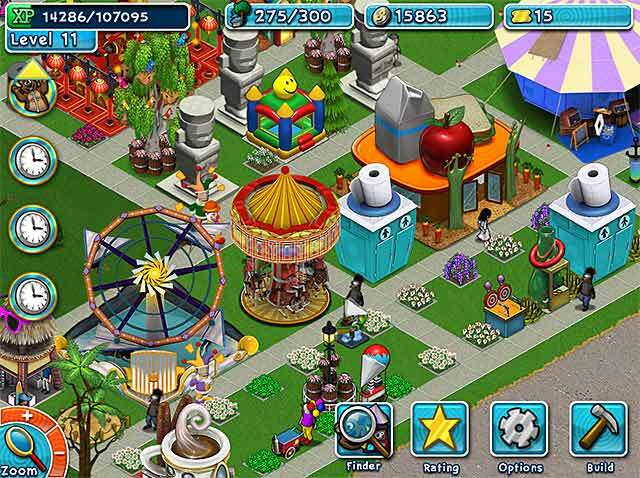 You have attractions and food stands which offer a variety of options. Items for decoration, mascots you can hire to perform, and quests to complete. Just a heads up, as with all Free To Play games, they evolve over time and are meant to be played slowly and not devoured and finished in a day or 2. Rated 3 out of 5 by hopsandshots from Good if you hate spending time on playing games If you like spending as little time as possible, as well as making extremely slow progress in a game, then this is for you! I have been playing for about 2 months now, DAILY, and I spend maybe about a total of 4 minutes a day on the game because there is NOTHING to do. It is strangely addicting as I keep going back to it, but seriously, it takes FOREVER to make money and to progress in the game. Also, there are a few missions that glitch. I have about 3 or 4 quests that I have completed, however their progressions don't happen. Every day the mission status remains the same, as if I hadn't done anything to progress the mission along. I am verrrrry close to uninstalling the game. I have given too much time to progress verrrrry slowly... or not at all. This game is a bust. Rated 3 out of 5 by mendolyn from meh this game has many of the EXACT same buildings as Dream Builder: Amusement Park (you can buy it here on Big Fish), so i'm guessing this is made by the same people only now with the intention of making more money through the new (and in my opinion abhorrent) in game purchase method. Free is NEVER Free. I already bought Dream Builder and had lots of fun with it so I'll pass on this recycled and sloooow moving version. If you like faster pace sim games without spending extra money, try the all inclusive version instead for just one purchase at the regular games price here on Big FIsh. Rated 2 out of 5 by qtpi1203 from Not for me I played about 10 minutes before I got bored to death. 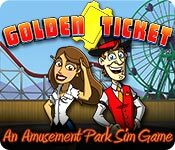 Rebuild the legendary Golden Ticket amusement park and restore it to its former glory in this simulation game.